Northeast of Beijing in Hebei Province lies the Mountain Resort in Chengde, the summer palace of the Qing Dynasty. Built in the 18th century, the resort was the yearly destination for the Emperor and his ministers, royal troops, family and concubines. To accommodate them, a vast complex of palaces, administrative and ceremonial buildings, temples and gardens were built which today provide an insight into the final era of imperial rule. Of the temples at Chengde, Puning Temple contains a 22 metre statue of Buddha while Putuozuosheng Temple is a replica of the Lhasa's Potala Palace. The Imperial Tombs of the Ming and Qing Dynasties are in five separate locations throughout eastern China all of which attempt to achieve harmony between the natural landscape and the tomb buildings. The Eastern Qing Tombs near Beijing, dating back to the 17th and 18th centuries, are the largest and most complete site which contain the tombs of 5 emperors, 15 empresses and 136 concubines, in addition to hundreds of lesser nobles in the surrounding mountains. Suzhou is located on the banks of the Grand Canal, an extraordinary engineering feat that connected the Yangtze and Yellow Rivers over 1,800km. This location gave the city, called the "Venice of the Orient" by Marco Polo, a great affluence which was manifested in the extraordinary gardens created here by the imperial elite. Chinese gardens seek to recreate natural landscapes in miniature and the nine gardens in Suzhou, dating from the 11th to the 19th centuries, are the best in China. The most famous is the Humble Administrator�s Garden which contains streams, ponds and beautifully decorated pavilions and a recreation of the scenery of the Lower Yangtze. Suzhou is also one of China's main silk producing towns, which can be purchased from street vendors and silk merchants in the city's Old Quarter. Ping Yao is a remarkably well preserved imperial Han Chinese city of the Ming and Qing dynasties (14th to 20th centuries). It offers a fascinating insight into the development of architecture and town planning over several centuries. China's first banks were set up in Ping Yao, which became a financial centre during the Qing dynasty and the Rishengchang Financial House is one of the most impressive buildings in the city. Ping Yao has very imposing city walls, dating to 1370, which are ten metres high and measure 6km in length. Along their length are six fortified gates and 72 watchtowers, each inscribed with a chapter from Sun-tzu's The Art of War. The great philosopher, politician and educator Confucius of the 6th�5th centuries BC was born and died in Qufu in Shandong Province. Two years after he died his house was consecrated as a temple. It was rebuilt in 153 AD and regularly renovated over the subsequent centuries, particularly during the Ming Dynasty in the 16th century. Today it comprises over 100 buildings and covers 20 hectares. Confucius's cemetery contains his tomb and the remains of more than 100,000 of his ancestors who have lived here for over 2,500 years spanning 77 generations. Additionally 152 buildings of the Kong Family residence have been preserved. The site rivals Beijing's Forbidden City in size and grandeur and represents an extraordinary historic and artistic heritage. 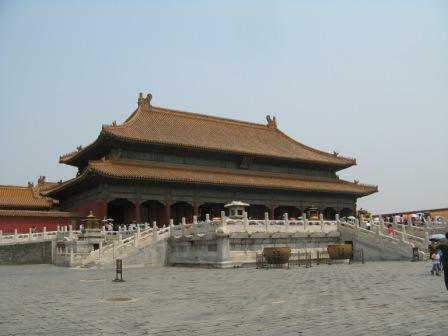 Organised group tours: Click here to see 18 tours to China which may include Legacy of Ming and Qing Dynasties.